The life of a writer is very complicated. I mean, I know life in general is complicated but THIS writer's life seems to be more so than usual. I figured out that I have three books to write by the end of the year. Two of them will be published this year. I have written about 100 words so far total. Why? It's complicated. Normally I have multiple projects going at once, but they're staggered - one book is just starting, one is almost done and one is in the editing phase. But right now, they're all just starting and my brain can't seem to get on board to at least focus on ONE. Some books just come to you. I don't know why that is, but some are just a bit effortless. Everything lines up and the characters talk to me and it all makes me very happy. I'm not a plotter at all. Well, that's not true. I plot the books that I co-write with Noelle Adams. Our process is so awesome that those books almost write themselves. But when I'm writing solo? It's all character driven. Sometimes I don't even know where the story is going as I'm writing it! It's hard to explain and when I try to, most people look at me like I'm crazy. And in the midst of all of this, I want to read. Like I really, really want to read. I just one-clicked a ton of books and now I have to find time to read them. And then there's the whole wife and mom thing and my family wanting food, clean clothes and love... LOL! See what I did there? Wink, wink! 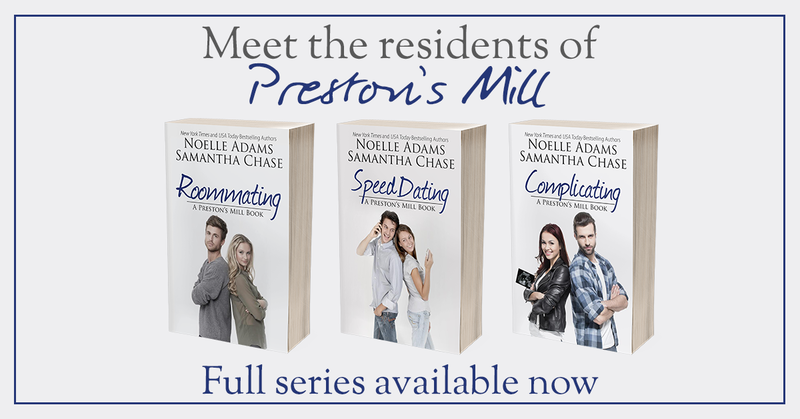 Book three in my Preston's Mill series that I co-write with Noelle Adams is out today! Woo-hoo!! We have had so much fun with this series - our first attempt together at writing romantic comedy. Book one was Roommating (our hero and heroine end up being unlikely roomates), book two was Speed Dating (hero has been in love with the heroine aka his best friend and now she's on a quest to find Mr. Right through speed dating) and today's release - Complicating - has a surprise pregnancy! 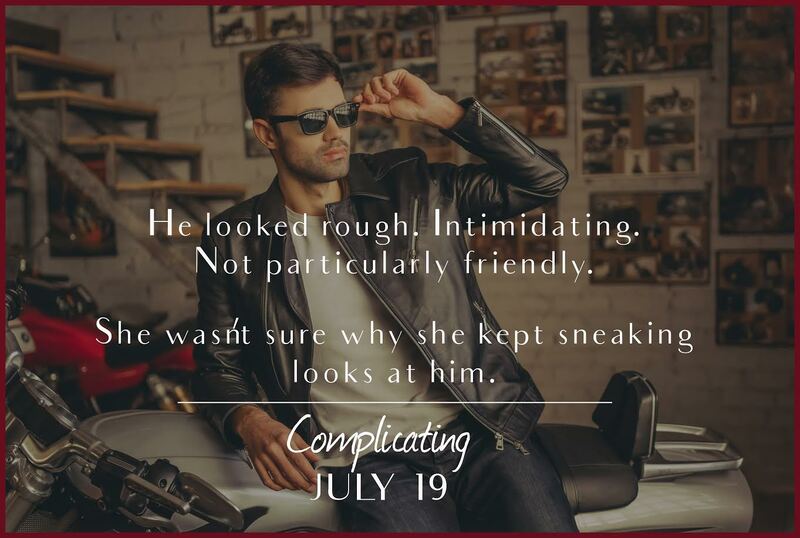 Super fun story with the opposites attract thing going on - Daisy is a good-girl librarian and Carter is a tatted motorcycle mechanic. Carter barely glanced up from the page to give Kirk an annoyed glare. “You could just call animal control,” Kirk suggested. “Weren’t you just the one who said people will run from him? Do you honestly think they’re going to find someone to adopt him?” he scoffed. “And the new studded collar he’s now wearing?” The smirk on his face made Carter want to punch him. Kirk gave him a look that said otherwise. So to celebrate this release, I am giving away the trilogy - SIGNED - to one lucky reader!! Woo-hoo!! To enter, leave a comment below telling me your favorite romance trope - friends to lovers, enemies to lovers, opposites attract, secret baby, surprise pregnancy, office romance...I can go on and on! Tell me your favorite or a chance to win!! I love friends to lovers romance. I loved Complicating! The writing and storyline was flawless. Beautiful story that is on my read again list. My favorite romance troupe would be a toss up with second chances, friends to lovers, and sibling best friend. I love them all. I love them all, but friends to lovers is a favorite. Hate to say it but I love them all. Friends to lovers, but I have no issues reading any of them! I love second chance romances...and friends to lovers...and best friends brother/sister...and...well, maybe it's easier to say just about everything! Margaret!!! You are the winner!!! Woo-hoo!! Please message me with your mailing address on FB!! Friends to lovers ìs my all time favorite - I feel like they already have the base of a successful long term relationship!! That's hard because I honestly love them all!! But the do think my very favorite is friends to lovers. I am a friends-to-lovers lover first and foremost, but I just love contemporary romance in general so I read it all! I love them all, but Friends to Lovers I guess. I absolutely love Complicating. The characters were so relatable. The series as a whole was great, and I liked that u could read them as a series or as stand alones. Samantha Chase and Noelle Adams have a great chemistry and can't wait to see what they come up with next. So much depends on my mood but I'm always a sucker for a baby. Not necessarily the pregnancy part but the actual baby being there is what I love. Friends to lovers. It's an adorable, true to life scenario. Friends as kids, go their separate ways and meet up as adults... for some reason that hits me. Love ya Samantha!!! Friends to lovers. Thanks for the chance. I love anything you write Samantha! I love them all. Second chance, surprise babies, love at first sight, friends to lovers, enemies to lovers. Friends to lovers, enemies to lovers and opposites attract are all my favs! Thanks for the chance! Second chances. But I read them all. I like opposites attract and enemies to lovers, but the interaction and connection between the characters is more important to me than the particular trope. They are all great. but enemies to lovers is extra fun! Love hate to lovers stories. The banter and build up is so fun!